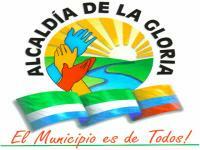 La Gloria is a municipality in Cesar Department. It was founded on 8 December 1800 by Benito Torices Bermudez, Juan Cruz Uribe, Gregorio Arias and Hermógenes Maza.and became a municipality by ordinance 004 of 1 July 1888. The flag of La Gloria is horizontally divided (inner ratio 2:1:1) green-white-blue and charge with a rising sun on bottom of the upper stripe. - White, symbolizing the pacific relationships among the sons of this people, the cause of the nickname of "Haven of Peace" awarded to the municipality. In the middle of the flag, a rising sun representing the beautiful sunset appearing on the banks of river Magdalena, radiating joy, tranquillity and clam to the natives and foreigners. The upper rays represent the "corregimientos" while the lower rays represent the "veredas", shown in yellow representing the resources of the municipality. - Blue, recalling the lakeside-like, bank zone and its big fish and agroforestry resources, watered by the majestuous river Magdalena, carrying the water potential from the mountain and savanna."